There are few things in life that will, without fail, make me cry. I am not one of those girls who likes to go see cheesy rom-coms or Beaches-type movies and cry, just for the record, and commercials about starving children don't move me anymore (the animals ones, yes). The Olympics is one of those things that always, without fail, reduces me to tears, and those tears come fast and furious. I've become famous throughout my life, and yes, also laughed at, for crying at every medal ceremony, during all the sentimental broadcast stories, and yes, even at completely random times while watching the Olympic Games. I'm a sucker for a good story of triumph, and there are no greater stories of triumph than those at the Olympics. Plus, the Olympics are the only time (except for, you know, that one time) when the world comes together in such an incredible display of talent and teamwork. Competition, yes, but also teamwork. Its the only time I feel legitimately patriotic for weeks at a time. 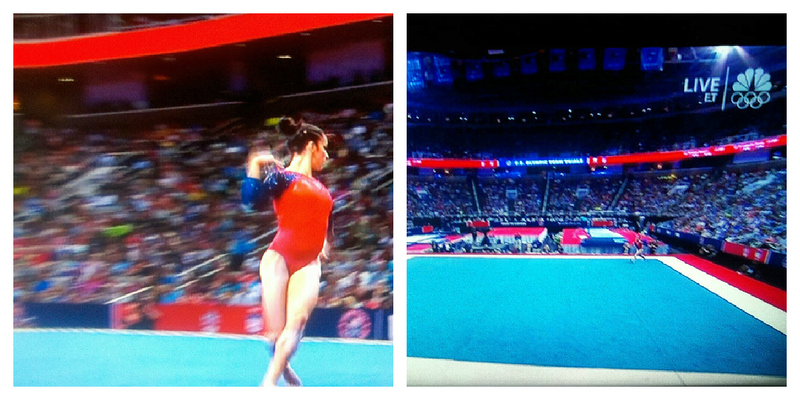 But anyway, gymnastics. I've loved gymnastics since I was about 6 or 7 years old. I did gymnastics for several years, but I was never very good at it. Wait, correction: I was always extremely flexible, somewhat grotesquely so in fact (I could do center splits and hyperextend my legs, up to when I was 17 years old). But I was terrible at the other things that go into making a great gymnast: strength, fearlessness, and mental toughness. That's cool. I'm OK with it. Instead, I've followed the sport closely since the 1992 Olympics, and its very emotional for me. It always will be. After all, I spent my childhood dreaming of "what might have been." I've been watching the Olympic Trials tonight, and it has been emotional ... very emotional. I am particularly sad for Alicia Sacramone, who appears to be a non-entity this time around. She is my favorite gymnast of the last 12+ years, for sure, and its a bummer to see that she was hardly even included in the broadcast (not a good sign). & poor Nastia Liukin, though her attitude is great. I LOVED the 1996 and 2008 teams, and they included many of my favorite gymnasts. I am really, really excited about this year's team, though, as the Chinese won't be as strong this time out of their home country. It's going to be a good year.